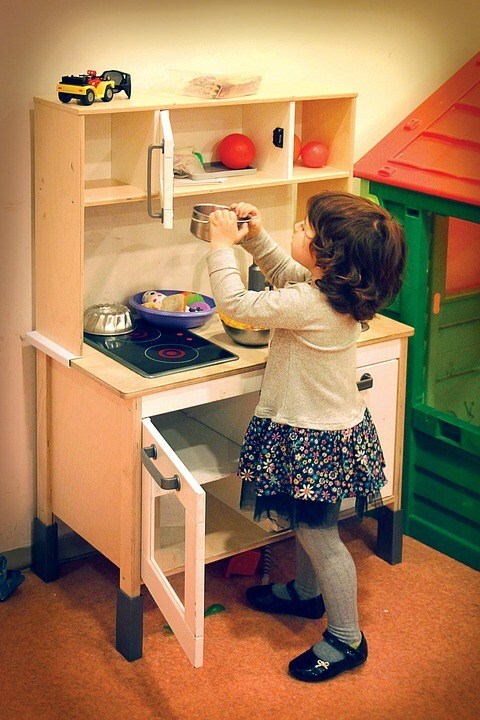 When it comes to sharing our things, kids’ stuff provides an opportunity like no other. Parents know all too well how quickly our kids outgrow their clothes, shoes, and bikes. Many of us are fortunate to have older cousins or friends who pass along their “gently loved” (and sometimes “not-so-gently-loved-but-still-functional”) items. And some of us, like my family, are also lucky to live in places where there are lots of pathways to sharing our kids’ things, providing great opportunities to help our children learn the value of reusing and making do. Unlike shopping at a regular retail store, which often fills me with dread, shopping at children’s consignment shops feels good. We have three great ones in our area, and I’ll often pack up a bag of my kids’ too-small clothes (many of which were hand-me-downs to begin with), and “swap” them for larger or in-need items. Rainboots and summer sandals are some of my favorites items to give and find at resale shops, since 1) they’re expensive to buy new and 2) they’re usually only worn for one season before a child outgrows them, so they’re typically in great shape to share. Kids’ consignment shops that carry toys can also make for fun, free outings for the kids, especially on days when the weather makes extended outdoor play tricky. If we’re not going to buy any toys, I always make sure to let the kids know ahead of time so they’re not expecting to take one home. But sometimes we do splurge on a secondhand toy or two, and that’s a-ok by me. Several email lists and Facebook groups in my area help people buy, sell, borrow, and lend kids’ items directly to each other. The two that I’m part of are thoughtfully moderated and have a strong community vibe. Many of my local mom friends are active in these groups, too, so it feels like another way to connect and help each other out. One of the groups is called “Closet Sharers,” a concept I love. Members of this group will often post items with a suggested price and offer, “Porch Pickup Available.” This translates to, “If you’d like this item, I’ll leave it on my porch (or some other area near my house) for you to pick up at your convenience, and, even though I likely don’t know you, I trust you to leave the payment.” I love that trust in strangers in baked into the culture of the group. We’ve picked up many great items from porches over the years, including a balance bike that was a present to our oldest son on his third birthday. I’ve also connected with many great folks as we’ve passed our things on, like the dad who picked up our double stroller after we no longer needed it (and had bought secondhand ourselves), who planned to give it to a family in need in his neighborhood. While somewhat controversial, park toys are toys that people leave at the playground for neighborhood kids to use. It’s not officially sanctioned, but many of the parks in our area are homes for tricycles, toy trucks, play kitchens, and other items that have been passed on from someone’s home. "It’s not officially sanctioned, but many of the parks in our area are homes for tricycles, toy trucks, play kitchens, and other items that have been passed on from someone’s home." Some parents don’t like the trend because they consider it “dumping toys at the park.” And it is true that sometimes the toys that are left are not in the best condition (though often they do have lots of life left in them). It can also become a hassle to ensure the removal of toys that have finally bitten the dust and are no longer safe and/or usable. While my family doesn’t usually leave toys at the park, I appreciate the ones that are there. We know there’s no need to own a ride-on toy when there’s one we can play with at the playground across the street. But I do take on the role of making sure that toys that are broken or unsafe are properly discarded, and use it as an opportunity to talk to my kids about toys and other “stuff”—where things come from, where they go, and why it’s best to buy less. For the past several years, a local community center has hosted a Halloween costume swap each October. The event encourages kids and parents to “go green this Halloween” and to bring a gently worn halloween costume to swap for one that’s “new to you.” Love this idea! Used children’s items are a good way to raise funds as well. Many preschools and elementary schools in our area host annual yard or gymnasium sales, where parents and kids who are part of the school community donate things to be sold in a public sale, the proceeds of which benefit the school. Do too many of us buy too much new kid stuff to begin with? Yes. Do marketers aggressively (and in the case of our children also unethically) work to convince us that kids need this and that new deluxe thing-a-ma-bob or light-up high-performance sneakers or a million other unnecessary or harmful products? They do. As we work to change our purchasing habits, our hyper-consumer culture, and the forces that fuel it, we can also do something radically simple in our communities as our kids grow: we can share! What are the best ways to share children’s goods where you live? If you don’t know what sharing opportunities already exist near you, do a little digging. Try asking a few of your parent friends in the area, or posting to an online forum your community uses. Or share this blog post as a way to spark ideas and interest! If you find there’s not much already in place in your community, or you think there could be more, you can make it happen. And you’ll become part of the movement of moms, dads, grandparents and many others across the globe saying “no” to excessive stuff and “yes” to more of what matters: connection, community and care for each other and the planet. New Dream’s Community in Action “Share With Others” Challenge is the perfect springboard to sharing children’s items in your community. Whether you’d like to offer to share a toy with neighbors, plan a children’s clothes swap, or start a toy library, New Dream will send the resources you need to your inbox. Share Drew is the director of New Dream's Kids & Commercialism program.